I am always trying to sneak foods into my kids diets. That is exactly what I did with these Chocolate Chip Chickpea Pancakes. I got the idea to make these pancakes because I have been making these chickpea omelettes lately. I make a savory version for myself, but I noticed that the chickpea flour had a sweet taste to it. So I knew these Chocolate Chip Chickpea Pancakes would be good. These are a little thinner than traditional pancakes, but very good. Almost like crepes. You guys! My kids gobbled these up! I love that they are getting a boost of protein and fiber with these. So they will stay full longer. That is something you don’t get with traditional pancakes. These chickpea pancakes were a cinch to make. They are vegan, gluten free and grain free. The perfect healthy breakfast recipe. One of the best parts of this recipe is that the only wet ingredient you need is water, so you can make the mix up and store it in the fridge for whenever you get the urge to have some pancakes. 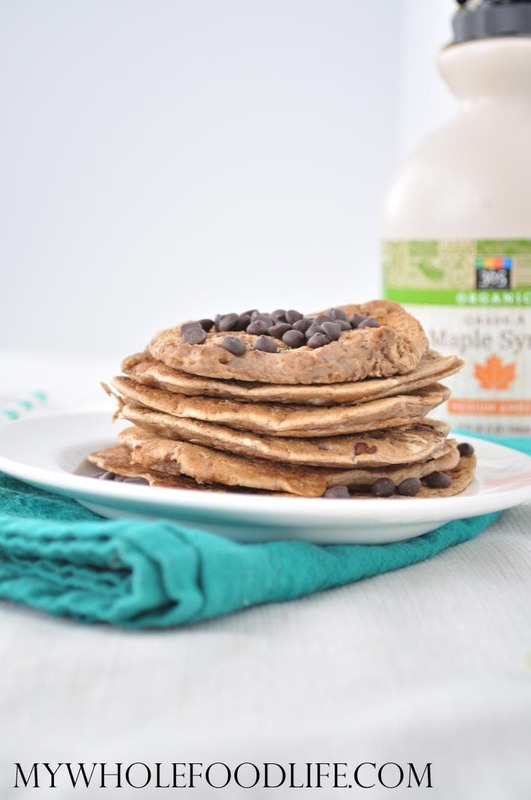 Healthy pancakes with a boost of protein and fiber! Heat and oil a large saute pan on medium heat. Add 1/4 cup dry ingredients, except the chips, + 1/4 cup water to a new bowl . Mix well and let sit a minute. Pour mixture into the saute pan . Once it starts to bubble, flip the pancakes. Repeat these steps for the rest of the mixture. To make each individual pancake, you need to mix 1/4 mix + 1/4 cup water in a separate bowl. That will make only one pancake. To make more, you need to repeat those steps. You can store the remaining pancakes in an airtight container in the fridge or freezer. Enjoy! OK, I'm feeling stupid. Since "all dry ingredients" includes the chocolate chips, why am I adding more chips after I mix wet/dry ingredients? If I have approximately 2 1/4 cups of dry ingredients (assuming 16 T per cup), how do I make 12 pancakes out of 9 quarter cups of dry mix? I'm mixing 1/4 C each of dry & wet for EACH pancake? AND each pancake is mixed in a separate bowl? Or does each 1/4 C of dry mix make approximately 12 pancakes? Am I just overthinking this? When I said all the dry ingredients, I meant everything but the chips. Sorry if that wasn't clear. I will edit the post. To make each individual pancake, just take 1/4 cup dry mix and add it to 1/4 cup water. That makes one pancake. To get the rest, just repeat those steps until all the pancakes are made. Honestly, the 12 pancakes was a guess. Mine ended up all different sizes because they spread out different each time. I hope that helps. These were surprisingly good!! I suppose you can buy chickpea flour but I made my own by grinding up raw chickpeas in my vitamix dry grains container - easy! Thanks for the recipe. So glad you liked them Ellen! I was wondering if I could just grind up raw chickpeas in the Vitamix....Thanks for posting you did that! Never mind kids will love these- I'll love these!!! We all loved them here! Do you like the chickpea flour? Do you think it makes a big difference in terms of healthy options or do you think regular flour is OK too? Could you replace the flax meal with ground chia seed? I'm excited to try this, I love all your recipes. My question is. Can I omit the sugar? Can I use a natural sweetener instead? A fruit perhaps? I think you could possibly to that. Maybe a date paste? Or a small amount of banana? Yay!! Glad that date paste worked! ... and I just looked at the omelette recipe & realized that it requires mixing them individually as well!! Ha! That's too funny. I don't think I have 2 cups flour left anyway. What else can I do with it??? So glad you liked them! I bet they were super delish with bananas!